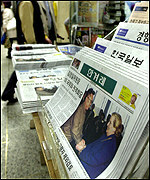 There are at least three dozens of webpages that feature daily English news from Korea. At the end of the page you can find some links for that. But on this page I want to feature just a very few ones which I found very interesting. These will gove you a better insight to the people and the culture. If you find interesting articles/reports in magazines or newspapers please mail them to me. "A private relief group estimated the number of North Korean death from the famine at about 3.5 million in 1995-98, much higher than the U.S. congressional estimate of 2 million. Pyongyang's own report said 220.000 North Koreans died of hunger in 1998." Electronic Firm Is Trying to Raise Its Profile in Europe and the U.S.
David Steel, 35-year old Briton, was recently named to the highest executive post ever held by a foreigner at Samsung Electronics Co. His assignment: to help the conglomerate act more global. At Samsung, that challenge begins with the commute to work. One recent winter day at 7 a.m., Mr. Steel sat on a crowded Samsung bus with other employees heading toward the chip maker's manufacturing comlex outside Seoul. When the last employee walked on, the only empty seat was next to the blond Mr. Steel. The man eyed at him nervously, and chose to stand for the hour-long ride. "People feel a certain discomfort sitting next to me, even though we work in the same office," Mr. Steel laments. He says that it is not because his colleages are unfriendly, but they fear speaking English improperly. It is likely a taste of that is to come for Mr. Steel, as South Korean's biggest conglomerate seeks to adopt a more worldly posture. Samsung's management, until recently, was dominated by the founding family and is still filled with career-long employees. Until three years ago, more than 90% of its executives had graduated from Korea's prestigious Seoul National University and had been with the company for at least 20 years. But this uniformity is in conflict with Samsung's crusade to become a global electronics company on par with Sony Corp. Until the mid-1990s, Samsung made electronic goods for other companies. Now, it makes its own products, from cellular phones to MP3 players, including some of the world's top-selling consumer electronics. About 70% of its $24.6 billion (€27.8 billion) in revenue last year came from overseas. The company's next step has been aggressively trying to raise its profile in the U.S. and Europe by forming strategic alliances with the likes of AOL Time Warner Inc., Sprint Corp. and Microsoft Corp. The next step for Samsung, which employs about 66,000 people in 50 countries, is to teach its managers to become to be more global in their outlook. "We want to strengthen and develop the ties we made with our foreign partners," says Ahn Seung Jun, a vice president at Samsung's corporate-human-relations team. "One way we plan to do that is by going after the best foreign talent." Enter Mr. Steel, who started with Samsung four years ago as a senior consultant. In January, the company's chief executive, Yun Jong Yong, appointed him voce president of business development. Officially, Mr. Steel, who graduated with honors from Oxford University and earned a doctorate in physics from the Massachusetts Institute of Technology, is responsible for alliances and partnerships. He is often on the road with Chin Dae Je, the chief architect of Samsung's memory-chip business. Unofficially, he also is responsible for helping Samsung's executives interact more naturally with their counterparts overseas. Mr. Steel and his six-person team, the other members of which are Korean, will spend some time studying the company's various departments before making recommendations. But client relationships already is emerging as a problem area. When Samsung executives meet with foreign customers to discuss future purchases, for example, Samsung's requests are often construed as demands. "Several times, I saw Samsung telling our clients what they should do. … 'Your company bought this much last year, so we want to buy that much next year'", says Mr. Steel. That may not be considered impolitic (this word is a new creation of the Korean editor - Jolle) in Korea, but it is enough to worry Mr. Steel. "I told my colleagues that we could never strengthen and build relationships like that," he says. Mr. Steel has begun distributing research material to his colleagues before each trip, highlighting the client's interests and goals. He says he has noticed that many of the people he works with contact customers only when they need something. He is pushing his team to write more e-mails and letters to Samsung's clients to nurture those relationships. Every week he asks his staff for updates. This drive to be more attuned to other cultures and business styles is playing throughout corporate Korea, as once-insular companies begin to open up to new ideas. Many companies, for instance, have moved to performance-based bonuses rather than lockstep increases determined by seniority. At the same time, promotions are increasingly merit-driven. South Korea's financial sector is a hotbed for these kinds of changes, as some of Korea's biggest banks were taken over by foreign management following the regional economic crisis. "The most important thing about my recent promotion is that it gets me a seat at the table," Mr. Steel says. He now attends all executive-level meetings, where he can pitch ideas and suggestions directly to other executives. But Mr. Steel's early experiences show that simply putting a foreign face in an annual report, or even giving him a seat at the decision-making table, doesn't automatically change a deeply entrenched corporate culture. He remembers a recent business trip to the U.S. to meet clients in which he entered a meeting with an entourage of 15 Samsung employees. Although it is common among Korean companies to travel in packs, Samsung's U.S. clients were startled. They had to scramble to find chairs for everyone. Since then, Mr. Steel has tried to pursuade Samsung's executives to send fewer people to meetings at U.S. and European companies. Mr. Steel, who speaks and reads Korean well enough to get by without a translator, says he has raised the matter over a dozen times at Samsung's weekly meetings. "Intellectually, they would agree, but come next trip, everyone ends up going," says Mr. Steel. He confesses that his job can be frustrating and at times discouraging. "I've learned to choose my battles," he says. Copyright © 1999-2002 Johannes Beck. All rights reserved.